Excitement and Satisfaction. Those are the feelings every time I received Stock Alert email from Truly Rich Club. Thank you so much, Bro. Bo, for sending this Stocks SELL Alert. 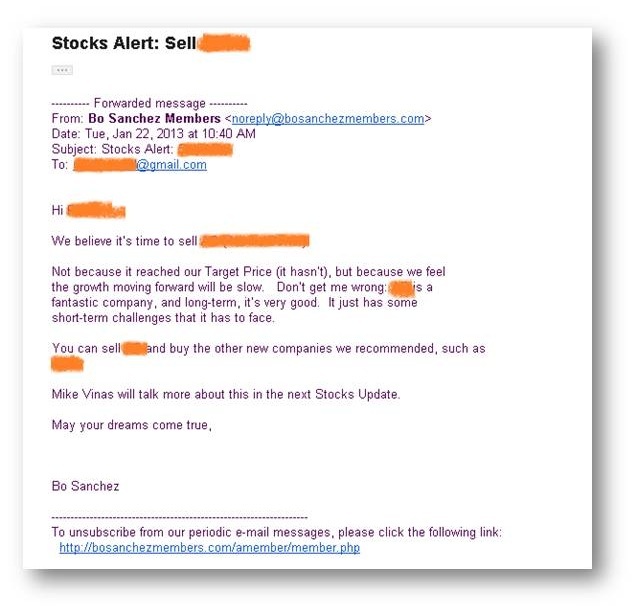 Below is an example email of Stocks SELL Alert from the Truly Rich Club. An email like this is probably the best that you can have if you are into stock market investing. Did you notice SELL alert above? Bo Sanchez mentioned that the target price for that particular stock hasn't reached yet (return of around 20-24 percent, not bad!) but then he's ASKING to SELL it immediately and BUY new companies that was previously recommended. I feel excited every time I received a SELL ALERT from Bro. Bo Sanchez. Why EXCITEMENT? Because it's SELLING TIME. 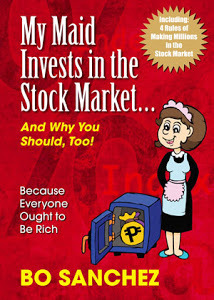 One purpose of investing in the stock market is for me to gain additional money for my family future. Of course I can see from my portfolio whether my stock is gaining or not. The only thing I wanna know is: WHEN is the RIGHT TIME to SELL this? If it is already time to SELL, WHO will tell me? That's the PURPOSE of the club. The only thing that you will do is to EXECUTE. Not Pa-Cute, but to execute! I feel SATISFACTION because I can see that my money is secure without worrying too much risk. Like this STOCK UPDATE. Bro. Bro. Bo, send us important email alert message. And because of those alert messages, I can now able to act accordingly and execute right after. Again, thank you so much for the Truly Rich Club private mentoring for making stock market investing so EASY!